Every chess master was once a beginner. Even the great ones like Kasparov, Anand, Carlsen and Kramnik knew less about chess at one point of their career than you may know now. With experience you look back at the ‘old days’ when you first start playing chess and think with irony, I wish I knew that earlier! Why no one told me that before? My results would have been better, much better. 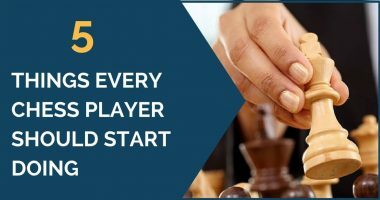 This article is for those who just starting out playing chess and want to avoid mistakes many players make. I cannot count a number of times I have observed a novice playing chess and losing just because he or she did not take enough time to think. If you have a habit of making your moves 1.5 seconds after your opponent made his, you need to use the following method to get rid of this bad habit. This is something that happens very often, on all levels of chess from 1200 to 2700. Let’s assume we are 1400 rated and are about to face 1800 opponent for the next round. A typical 1400 rated player would see the difference in ratings of 400 points and already gets frightened of his opponent. He would set himself a limit to draw the game (without even a possibility of winning), since it’s impossible to beat such a high rated guy. Then, he would exchange a few pieces and passively wait for that magic draw to come, just to lose due to some tactics missed while being intimidated by the opponents rank. There are multiple methods of dealing with that issue. Some players don’t check their opponent’s rating before the game; some people actually get themselves together and play better chess if they know their opponent is higher rated. Do whatever works for you, and remember, ELO points don’t win the game, good moves do! This is a continuation of the previous point. I have already mentioned that you should not be afraid of your opponent regardless of the rating difference. If you do, the game is lost before it even began. As I have written before in How to Beat a Stronger Opponent at Chess most players mistakenly assume that achieving a simple position on the board is the best way to draw a higher rated opponent. Why is that not the case? Because higher rated players usually play simple (standard) position much better than lower rated players. That’s pretty much the reason why they are higher rated. So, what do we do in order not to lose the game then? Exactly. We need to complicate the position as much as we can, play actively, attack your opponent and create as many problems for him as possible. This way, even if you lose, you will lose actively fighting and not passively waiting for your opponent to come and checkmate you in the corner. Food is quite an individual thing since some players play better chess before they have a meal and some players play better chess afterwards. The general rule of thumb is to avoid big meals before an important game and consume something ‘light’ before the game. If you had too much food your body will concentrate of digesting the food lowering blood stream to the brain, which may affect your chess performance. On the other hand, if you’re hungry, fully concentrating on chess may be difficult. You can read more about chess diet in one of previous my articles. Many players play the first game of the day really badly, blundering and losing quickly. Don’t make their mistake. If you have an important game coming, take 15 minutes of your time and solve a few easy tactical problems just to warm up your ‘chess muscle’. There is no need to pick anything challenging at this point, you’re also building up your confidence. It is especially important if you play chess in the early morning when your mind and body may not be completely awake and ready to be totally productive. I had trouble myself playing first round games in the mornings since I didn’t turn into a game right away. That cost me many loses and draws in good positions. After I start practicing this little tactical warm-up trick, I noticed my first game of the day results improved a lot. This is another very common problem that can be seen in the game of novice chess players. 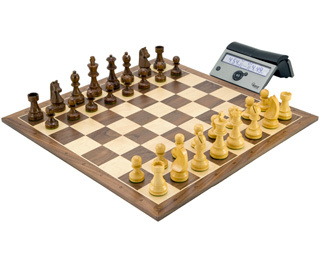 Some players resign immediately after they lose a pawn or two playing on 1300 level. In fact, on that level even if you’re a piece down you can still manage to win the game thanks to your opponent’s blunders. Don’t resign unless you absolutely sure the game is lost! If there is a tiny chance of drawing the game, play it on. It’s much better to play on in couple of lost games for a few moves, than to resign a drawn game. You may want to check out my guide how to play chess in a lost position. This one is really important, on all levels of chess play. Imagine you find a nice tactical combination with a queen sacrifice, leading to a mate in two. You’re so excited and want to astonish your opponent and to end the game quickly claiming your win by a tactical brilliancy. You play a first couple of move quickly sacrificing your queen and preparing to checkmate your opponent. And then… oh my God, did you really miss something? It’s not a checkmate and the opponent’s King has an escape square? Now all the excitement is gone and you need to play being a queen down. Pretty much the game is over for you. Lesson to learn from here is simple, if you want to sacrifice something always, always and I mean always double or triple check you tactics! If you’re sleepy, you will blunder and lose the game. It’s as simple as that. Do whatever it takes to keep yourself awake and focused during the game. That includes diving into a cold swimming pool, running sprints, doing pushups, etc. But seriously, stay awake and you will reduce the possibility of making a blunder. Some people stand up and walk around during the game when their opponent is thinking. Others drink water during the game. Some grandmasters splash cold water on their face in the bathroom during the game to get a little refreshed. Imagine you are up a piece and now you think that the game is pretty much over and you’re just waiting for your opponent to resign. This is the most dangerous time to get overconfident, to make a mistake and to lose a completely won game. This is a time when your opponent may come up with some brave idea to save the game and to attack since he has nothing to lose. Stays focused and look out for threats. Remember, the game is not over until your opponent is checkmated, his time elapsed or he resigns. In most other situations you can still lose the game. In order to stay focused on the game and play the best chess you need to learn to ignore any disruptions. That can be a snoring of your opponent, yawning of the spectators, somebody’s ringing phone or a smell of freshly baked pizza, who knows? Whatever happens, if it’s not a life threat, you should be focused on winning the game. Many chess players get nervous and stressed out during the game of chess. Look at Ivanchuk (YouTube), he is one of the top grandmasters and still gets extremely stressed out during his games, especially in time trouble. It’s difficult to deal with stress during the game, but if you manage to control it your result will improve. Good luck! Let me know what you think about these 11 advices by commenting below. If you have some other tips to add, don’t feel shy and write it in the comment field as well! Good advice, and yes, I wish I hadn’t taken years to learn these things! After playing almost no tournament chess since 2000, I played in two big-money tournaments last year and had the best paydays of my chess career, tying for second, undefeated, in both! My “secrets”? One, don’t be a wimp! I used to draw a ton of games (for example, all five of my games in the 1982 Midwest Masters) because I was terrified of losing. It’s just a game! 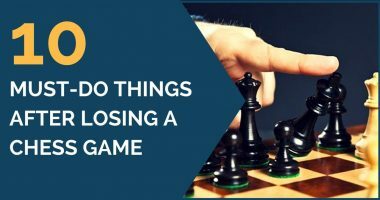 The world won’t end if you lose a game – so play actively (not insanely, but actively) and don’t accept a draw unless it’s dead drawn, you’re losing, or it guarantees you a substantial prize. Second, eat lightly before the game and eat snacks like trail mix or fruit during the game to stay alert. I used to eat a big lunch and yawned my way through the next game, with predictably disastrous results. Now I’m in my 50s but am much more alert at the board than I was as a teenager! [quote name=”Administrator”]Hello Joelson, thanks for your comment! Hello Joelson, thanks for your comment! Nice tips. On my state, in Brazil, i don’t have help enough for me to play chess, so i have to search for another options, like your tips or videos on another websites. I’ve identified some mistakes that i’ve made in some chess games that i’ve played and i’ll fix them. Thanks a lot, bye! Wow that’s super. One of the best chess articles I saw for a while! Thanks a lot! Now i think I can go back to the beginning and really improve training! I like the idea of warming up before the game. I don’t play much over the board chess, mostly online. But I play long time control 30 min games. And also I play tourneys. Can I use this technique ? Thanks Mr. Shibin. I’m glad you find it useful! juz the kind of things i wanted to hear..Great tips..